An important tourist destination having religious, historical and social significance. 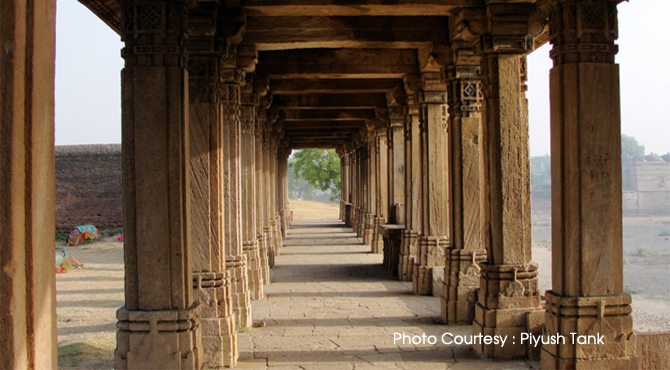 Sarkhej Roza, an important tourist destination is located 10 km towards the southwest of Ahmedabad. It is a complex comprising of tombs of kings and priests, mosques, palaces and gardens. Also a famous shrine of the Muslims in Ahmedabad, it is known for its architecture which is quite refined and elegant. The use of pierced stone trellises and complete absence of arches make this monument a special. The architecture is a mixture of Islamic stylistic influences inspired from Persia and also Hindu and Jain architecture to form an Indo-Saracenic architectural style. It is a mixture of Hindu craftsmanship and Islamic sense of geometry and scale. The highlight of Sarkhej Roza is that, it offers visitors a glimpses of the religious, social and royal worlds of bygone era. Sarkhej was initially a village whose population was mainly comprised of weavers and indigo-dyers who were predominantly Hindu. Later Sarkhej became associated with the name of a Sufi Saint Shaikh Ahmed Khattu Ganj Baksh. The saint was an advisor and religious counselor to Ahmed Shah, the sultan of Gujarat's ruling Muzaffarid dynasty (He founded Ahmedabad city). It is believed that the saint in his later years moved to the village of Sarkhej and lived there till the age of 111 years. He was greatly venerated during his lifetime and myth has it that the saint was renowned for miraculous powers. He died in 1445 and upon his death the then King Mohammed Shah (the son of Ahmed Shah) ordered to built a mausoleum and a mosque in honor of saint. It was during Sultan Qutbuddin time that the complex was completed. Later the buildings were renovated by successive rulers and administrators. A central tank was excavated and a number of pavilions and a small private mosque also built during that time. Mehmud Beghara also built a mausoleum for himself and his family, where his son and his queen Rajabai were buried. Sarkhej Roza also houses the mausoleums of Mu'assam and Azam, the two brothers who were responsible for Sarkhej's architecture. Later on a country house and garden were constructed to commemorate Akbar's victory over Muzaffar III. Thus this complex holds not just religious significance but it is also a reminder of Gujarat's socio-political past. The Sarkhej Roza complex constitutes a fine demonstration planning where the religious, royal and social worlds unites without losing their calm and identity. It can be divided into three realms like religious realm, social realm and royal realm. The Religious realm contains mausoleum of the saint and a mosque with cloistered court, the Social realm contains a huge tank, pavilions, steps etc and the Royal realm contains royal tombs and palaces. The royal tombs and the palaces are reminiscent of the grandeur of the past of sultan's and maharaja's. The architecture of the palaces is grand and their layout is simple and does not overshadow the tranquility of the serene surroundings of the mosque and mausoleums. It is located on the border of the complex. People are gathered during festivals and special prayer days at the pavilion, platforms and tank area of the complex. When pass through the entrance, one can get a view of the majestic mausoleum of Mahmud Begara to the right beside the tank and the Royal tombs to the left. The tomb of Sultan Mehmud Begada sprawls over a huge area of 140 ft and it is considered as one of the largest and most elegantly designed mausoleums in India. The lattice work in stone creates a wonderful play of light. Connected to his tomb, is the tomb of his queen, Rajabai and other queens. Also near to the tank is the Tomb of the Saint. The main feature of this is, it's large dome supported by a range of thirteen pillars on each side. It gives its visitors a concentrated and peaceful atmosphere. The mosque which lies beyond this has a spacious courtyard and multi-domed prayer halls and colonnades.